Acknowledgement / In An Individual Capacity: A formal declaration before an authorized officer such as a notary, by a person who has signed a document. That the document is his or her act. The person acknowledging the document must personally appear before the notary. In addition the signer also indicates in the notary's presence that he/she signs the documents of his/her own free will and was not coerced into signing a document he/she did not want to sign. Important: The signer does not have to sign the document in the presence of the notary, but the document must display the signer's originial wet ink signature. These stamps are made of high-quality materials that adds convenience to documents that do not contain notarial wordings or certificates. Stamp measures 1-7/16'' H x 2-13/16'' L and fully complies with state statutes. 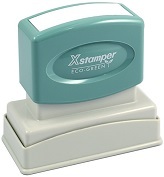 #213 - Rubber ($15.95): Provide good high-quality impressions and require a separate inked stamp pad. They offer a durable handle and mount that is made from wood. Requires stamp pad (not included). #214 - Self-Inking ($18.95): Provide up to 5,000 better high-quality impressions before the need of re-inking. They offer a spring loaded flip-around stamp body that automatically re-inks the built-in ink pad between each impression. #215 - Pre-Inked ($23.95): Provide up to 25,000 best high-quality impressions before the need of re-inking. They offer a die pad that is saturated with an oil-based ink that seeps through at a controlled rate. The ink doesn't dry out or evaporate and the mount adjusts for a darker or lighter imprint. 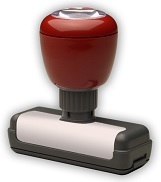 #215-A - Xstamper Pre-Inked ($54.95): Provide up to 50,000 premium high-quality impressions before the need of re-inking. They are eco-green friendly and provide a lifetime guarantee. They offer a specially formulated ink for maximum longevity and feature a soft touch handle.